Soft, slurred “whee-ur” or “mew.” Do not drum, but tap in a broken series. 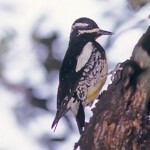 Description: Long, white wing patch; barred back; white rump; black chest band separates throat from a yellowish belly; bold black and white face pattern. Male has a red forehead and throat. Female is similar but has a red forehead and a white throat. Habitat: Associated with various woodlands, but favors those with poplars or aspens as these are preferred foraging trees. 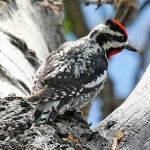 Where in Nebraska: Uncommon spring and fall migrant in eastern Nebraska, becoming rare in the west. Uncommon winter visitor in southeast, rare to casual elsewhere. 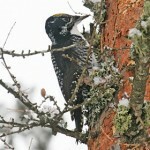 Fun Facts: A group of Yellow-bellied Sapsuckers is known as a “slurp” of sapsuckers. 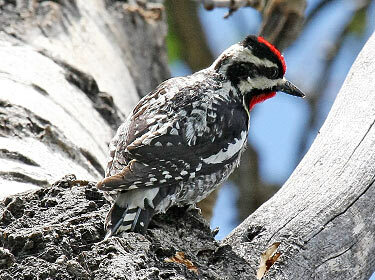 Additional Information: Formerly classified as one species with Red-naped and Red-breasted Sapsuckers.